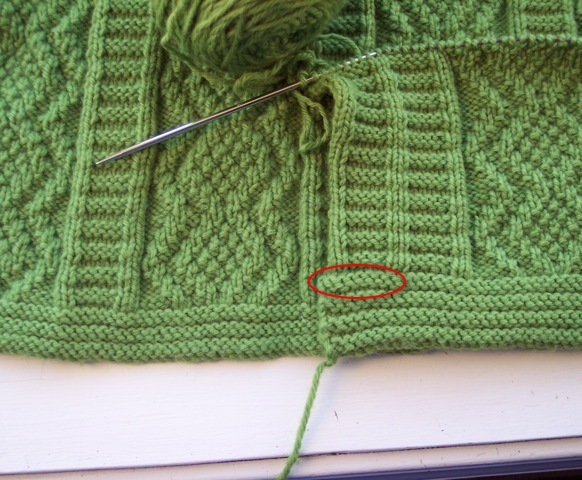 A while back, I posted an entry about my adventures with Alice Starmore’s Kinsale sweater. 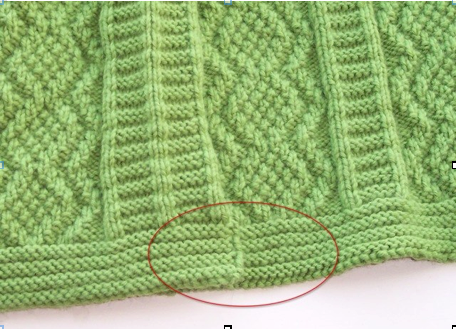 I had completed the back and started the front when I discovered, much to my dismay, that I left out a pattern repeat in the welt on the sweater back. 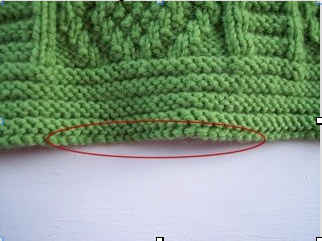 You can see in the picture above that there is one more ridge on the front piece of the sweater than on the back. I have it circled in red. Back to Kinsale. I mused on how best to fix this mistake. I had several options. 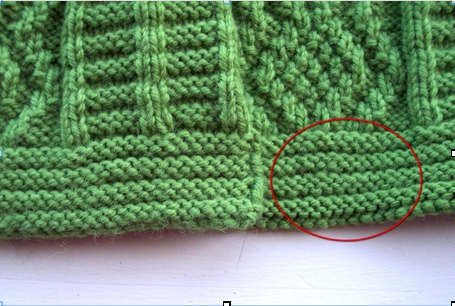 One, I could have ripped out the entire back and reknit it. Nuh-uh. Not in this lifetime. Two, I could have ripped out the front and knitted it to match the back and just called my mistake a design element. But since I had already completed three repeats of the pattern knitted in Alice Starmore gauge on tiny needles, there was no way was I going to rip it out. 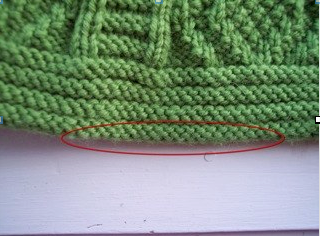 So I opted for option number three, which was to pick up the first row of stitches after the cast on, cut and pick out the cast on, knit the extra rows down from the picked up stitches, then cast off in a method that resembles long-tail cast-on enough that the difference wouldn’t be noticeable. No, I didn’t take pictures of the process. I probably should have, but I just didn’t think to do it. In this first picture, you can see that both welts now have four ridges. The back, where I made the original mistake, is on the right. This next picture is a close-up of the two welts. I circled the corrected one. It looks pretty darned good, doncha think? aren’t as good a match as I had hoped for, but the difference really isn’t terribly noticeable, either. I’m happy with the fix and that’s really all that matters, isn’t it?